The International Standards Organisation's standard, number 8601 is an international standard for date and time representations. It is used for all date-time representations in microformats, as well as a number of other formats (HTML5 <time> element & datetime attribute, XML Schema Datatypes, RDF, Atom). 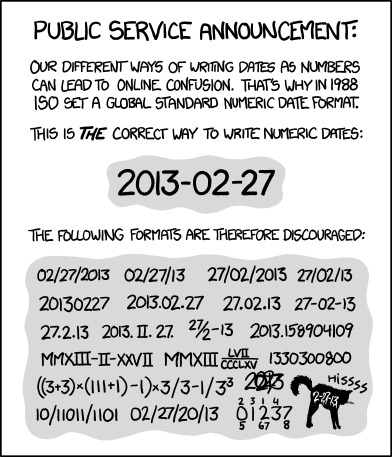 In addition, ISO 8601 dates in particular are the most globally unambiguously human readable/writeable date format and thus should always be used on the (world wide) web. microformats in general use a subset of ISO8601 - preferring uses which are more human readable (requiring hyphens in dates, and colons in times). All date-time properties in microformats use ISO8601 values. E.g. HTML5 uses both a subset of ISO 8601 for dates, times, durations for the <time> element, as well as an extended (and more human friendly) duration format. Ruby 1.9 implements an iso8601 method in the Date STDLIB but it does not handle ordinal dates. Glenn Jones' microformat-node parser includes isodate.js, a Node.js implementation of (some of) ISO 8601.
to do! document more implementations. Q: Must I use the hyphens? A: You should always use hyphens in ISO 8601 dates because that makes them more readable, and thus more human friendly.